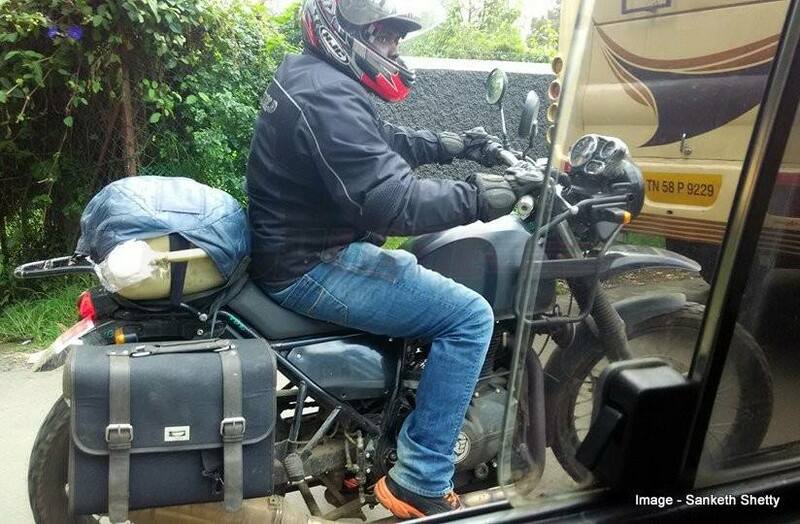 Set to be launched in a few weeks, the new Royal Enfield Himalayan has been spied again. Latest spy shots reveal the new RE fitted with full set of accessories. 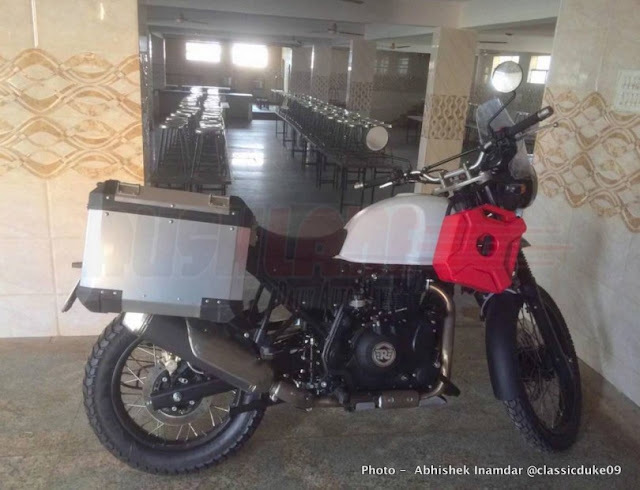 An off-road adventure tourer, Royal Enfield Himalayan will be powered by a new 410 cc single cylinder engine generating about 28 PS and 32 Nm torque. Finished in matte black ad with a silver RE badge, it is mated to a five speed unit. 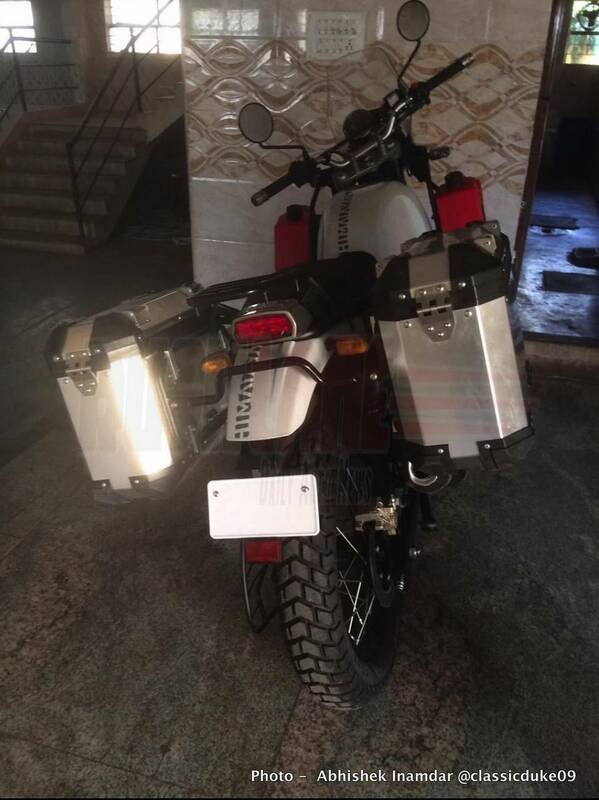 Decked up in white, spy shots show Royal Enfield Himalayan motorcycle fitted with metal containers (pannier) on each side of the rear seat. Earlier spy shot had shown the bike with cloth panniers, meaning there could be a wide range of accessories on offer with RE Himalayan. Apart from the metal panniers, new spy shots show the Himalayan wearing external plastic containers in red colour for storing fuel / water, etc, black iron bars structurally protecting the bike from external impacts, scooped rider seat for a relaxed riding position, raised pillion seat, exhaust design very similar to Bajaj Pulsar 220, front suspension with long travel, mono shock rear suspension, off-road tyres with disc brakes, skid plate to protect the engine, circular headlight with windscreen, instrument panel featuring speedometer, tachometer, altimeter, compass and fuel tank level indicator. All in all, a motorcycle which is designed for those who would like to have a bike which is always ready for a long road trip away from the civilization. A first in its segment, Royal Enfield Himalayan price is expected to be under INR 2 lakh. Once launched in India, it will also be exported to markets abroad.